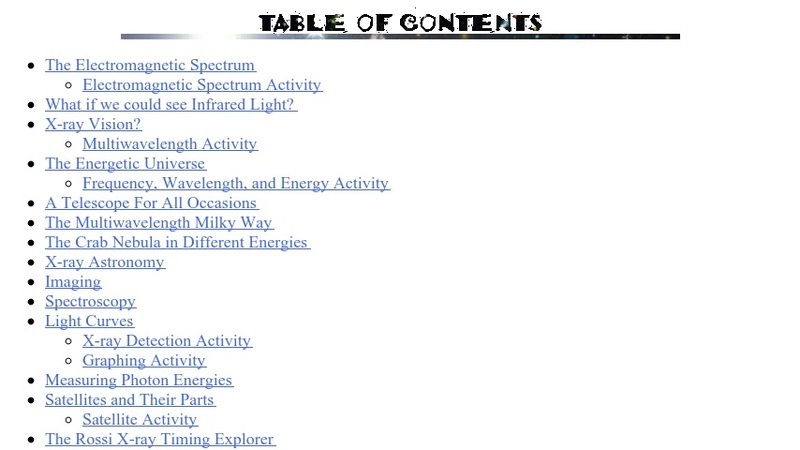 This is the table of contents listing for the NASA booklet "Shedding a New Light on the Universe". Each item in the table is a link to a specific topic. Topics include such items as the electromagnetic spectrum, frequency, wavelength, and energy activity, the multiwavelength Milky Way, the Crab Nebula in different energies, spectroscopy, satellites and their parts, and the Rossi X-ray Timing Explorer (RXTE). The linked pages feature text, photographs, scientific illustrations, and remoely sensed imagery.